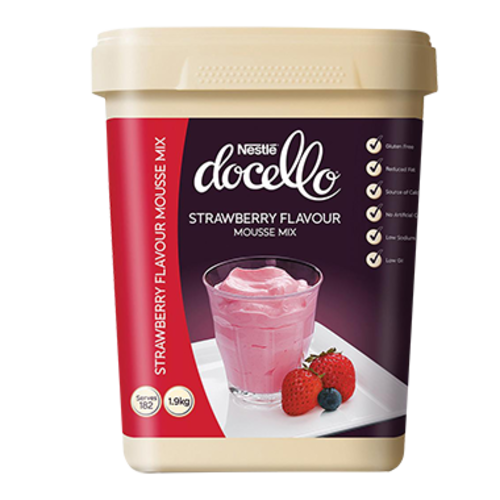 Make this delicious Strawberry flavoured Mousse by simply adding chilled water and whipping for 7 minutes. Ingredients When Reconstituted:Skim Milk, Whipping Agents [Vegetable Fat, Glucose Syrup Solids, Emulsifier (472b), Milk Solids, Stabilisers (401, 450), Food Acid (Citric)], Sugar, Skim Milk Powder, Mineral Salt (341) (From Milk), Stabilisers (407, 450, 339, 410), Flavour, Colours (100, 120), Food Acid (Citric). Contains Milk. Manufactured on equipment that also processes products containing Soy.